Posted by willhlaw in jPoint, jQuery, SharePoint, SPSDC. It started off a cold and rainy morning on 12/5/09 for the SharePoint Saturday DC conference. I had a car full of about 7 bags of donated clothes for the events clothing drive thanks to the Harris, Lawrence, and Wallenhorst families. The clothes were dropped off after my 8:30-9:40 session and by that time, there was a nice white blanket on the ground and snowing heavily! I hope the clothes from the event will provide warmth to several cold persons sometime soon. I kicked off my presentation with a “Taste of jPoint” video to wake up the audience and grab their attention. Tell me what what you think of the video. Ken from the jPoint team created it from some program on his new laptop. If you are prompted, username is demouser and password is sharejPoint! 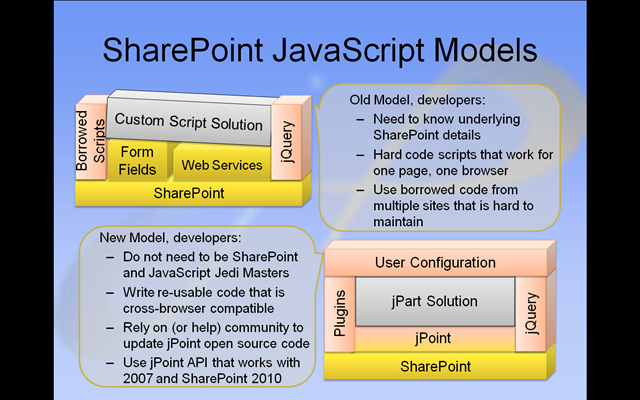 The presentation, entitled “jPoint: jQuery Based Library for Creating Web 2.0 Apps in SharePoint” had 4 parts. For the Web 2.0 App Demo, I gave a quick background and showed while describing another jPoint team member’s pre-recorded demo. I then talked through parts 2 and 3 with just a couple of on-the-fly questions from the audience. For the jParts: Live Demo, I was pretty confident I could do it live without trouble, as long as the website connection worked, since I had run through similar steps when I created a screencast earlier. Well, I was a little bit wrong. There were, of course, a few glitches, but I was able to smooth them out. In one case, I touted how Firefox with Firebug is such a useful tool for client-side developing on SharePoint. A few seconds later, I had to switch to IE so that I could inspect the contents of a form [editor] web part. Let’s go over it quickly. The first line uses jQuery’s $.each function which iterates through the form items and uses an anonymous callback function with two parameters. idx for the index and formjQueryItem which represents the Form item object (in other words, the cell that contains the Title, Assigned To, or Priority field. jP.Form.readForm() is called which reads the page’s html to extract the SharePoint columns or “fields”. readForm() returns a Form item object so that you can daisy chain this into one line to get the items, jP.Form.readForm().Items. The next line checks to see if the current name of the field (i.e. Title, Assigned To, or Priority), matches an existing URL parameter. If it does, then the last line is executed. The last line uses the powerful .val() function. To reference a particular field in jPoint, the array notation, jP.Form[“field name”] can be used or the dot notation, jP.Form.fieldname can be used. When using the dot notation, it is not recommended to use a field that has special characters or a whitespace. In jPoint you can, you just need to remove those before using it (i.e. Assigned To becomes AssignedTo). So back to the last line. jP.Form[formjQueryItem.Name] gives you a reference to the field item object. Passing a parameter to the .val() function acts like a setter. No parameters acts like a getter, just like jQuery’s val() function. Thus, passing the value of the URL parameter to the field item’s val function sets it. Thus, you can pre-populate any form field. To run the code, remember, you need to have both jQuery and jPoint loaded on the page. Below is the entire script. So, when I was finished with the live demo, I was at the 50 minutes mark. I had ten more minutes before the 10 minutes Q & A. After asking the audience, we decided more examples would be good. Rather than going off script and risk the few embarrassing glitches of the live demo, I explained a few of the jPart examples on the http://sharejPoint.com/examples website. I showed off the chatterbox solution as a pure client-side jPart. After that, I discussed the Bing Maps API and the story behind it. After ten minutes of that, it was finally ready for the Q & A. Oh, and before the Q & A was over, my laptop died. The camstudio session that I was recording…gone! Oh no. There were a few interesting questions like, “If I use jPoint in the enterprise, who is going to support it and for how long”. I answered “With jPoint being a good platform for developing scripts for 2007 that work when upgraded to 2010, it’s going to be around for a while. Plus, it is open source. You can look at the comments in the code and maintain it yourself. I really think that this project has legs and the more people I talk to, the more excitement and enthusiasm is generated and the word spreads”. One audience member summarized the session, “It was not as clear at first, but the demos at the end really helped to make it more clear.” I think there are lot of advanced concepts with jPoint, especially jParts and the deployment framework. There is a lot of documentation to be done. At the very end of Q & A, a bunch of audience members came up to talk to me one and one. One member was extremely excited about learning jPoint and has offered to contribute to the project, particularly in the documentation area. It is always great to bring on new volunteers to the project. Since I had a wedding all the way down in Raleigh, I had to leave right after Q & A. At 8:00am it was raining. At 9:45am it was snowing. This was not going to be a fun trip. Well, after making it to the wedding on time, we found out that we were actually late, because the wedding started EARLY! Who does that? I want to conclude with a big thank you to Dan Usher and Dux Sy Raymond and the other organizers for helping to make this event happen. And thanks again to everyone who contributed clothes! If you want to take a look at the slide deck, I have converted it into a PDF and made it available here. Posted by willhlaw in jPoint, SPSDC. See my previous post, I will be speaking on SharePoint Saturday to promote and support TWO good causes. Posted by willhlaw in Debugging. Screenshot is from this post by fritz-onion. Posted by willhlaw in jPoint, jQuery. Bill Simser posted a blog article two days ago that I wanted to reply to. The title was “Changing the Home tab in Multipage Meeting Workspaces with jQuery”. However, when I posted my comment, it did not show up. I know that sometimes, it takes a while. I waited, reposted my comments in Chrome rather than in IE7 and waited some more. But after an entire day and Bill tweeeting he did not see any comments, I am resorting to responding with a blog post. Thus, here is a re-hash of the problem Bill was trying to solve. On a Multipage meeting workspace, you can change the name of each meeting tab except for the “Home” one. Bill came up with a jQuery solution for changing the “Home” to “Zombieland”, or whatever you wish. However, he needed two separate script solutions on the “Home” page and the other pages because the structure of the tab changed whenever it was the current selected page (no link is necessary to click on the tab that you are already on). Here were Bill’s two solutions. Okay, I am not sure if you need your code on one line, but the following ninja code should work. Basically, I use find to search the children. And so as not to affect the structure, I do a string replace. I created a quick configurable script using jPoint so a user with edit page permissions can change the new tab name from “Zombieland” to something else. It uses the jPoint configuration model, so if you are familiar with it, it should be simple. If you are not, just drop the script onto a content editor webpart and you will see a yellow config screen with an edit button. Click that edit button to change the NewTabName from “Zombieland” to anything else. After the page refreshes, you’ll see your changes. No need for power users to mess with code. Here are the pictures to help explain the configurable script for Changing the Home Tab of a Multipage Meeting Workspace. When you click the Edit button, you will see the following configuration screen for the script webpart. So now, without having to be a developer, a power user or site admin could change the name of the “Home” tab to ZombieFire. Click Update and you will see the changes. Posted by willhlaw in Gov 2.0, jPoint. I have been working with SharePoint for 5 years in the Federal space in Washington, DC. I have never blogged publicly or gotten involved in social networking online due to the sensitive nature of my work and the environment. Instead, I just soaked in and absorbed all of the excellent blog articles and comment threads. Essentially I was a leach; taking but never giving. Over the years, I would have loved to have shared my discoveries in Sharepoint Designer, or Infopath, or even how to obtain SSP (single shared password) with FBA using a primary and secondary LDAP (secondary is Sharepoint’s AD and my expertise in this area is thanks to Chris Mathers and the fine people over at Planet Technologies. And now it has been almost 3 years since a federal client demonized a fellow developer for requesting help on writing on an Adobe forum asking about how to create PDFs with PL/SQL. I feel it is time to get out of my shell. Yes, jPoint has a novel way to deploy script solutions so that a power user (a user with Manage Lists permissions), can change the configuration of the script through a wizard. Here is a very simple example. The jPoint team has taken the Chatterbox solution that required AJAX.NET and a server deployment and jPoint-ified it. The jPartChatBox is a purely client-side solution using the jPoint library (which also leverages jQuery). To see the example live, click here. But you will have to login to submit your own chat and to see the yellow edit screen. The login credentials are listed on the Home page and the Examples page. And here is the configuration “wizard” that you see after clicking the Edit button. All a power user needs to do is make some changes, for instance, change the List that the ChatBox points to and click Update. The page refreshes and the new changes are in effect. And by the way, if you are thinking that this yellow edit view and configuration wizard looks awful and has a long way to go to match Bamboo Solution’s or Coraswork’s wizards, here is the catch. 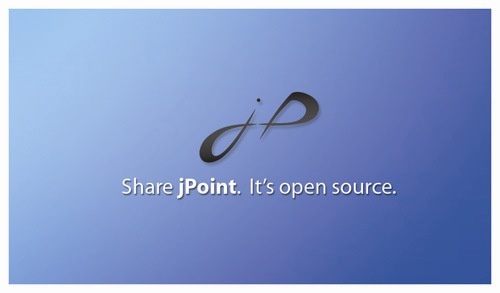 jPoint is an API and a deployment framework. For now, it is up to each individual or third party developer to make their configuration wizard look pretty. And of course, through time and once we solidify the core and hopefully attract more contributors, we can certainly integrate the best practices for setting up the configuration wizard and bring that into the core. Similar to how jQuery has pulled in certain critical plugins into its core. Well, that is it for now. I encourage everyone who wants to get involved write me a comment or follow me on twitter @willhlaw. If you are not interested in jPoint, stick around. I will have some good posts that are not jPoint related.